Louisiana Governor Bobby Jindal has said that he supports the elimination of the state’s personal and corporate income taxes. In fiscal year 2012, Louisiana collected nearly $3 billion in revenues from its personal and corporate income taxes. In order to pay for the drastic reduction in revenue that would come from eliminating them, lawmakers would likely raise the state’s sales tax rate or broaden its base by eliminating various exemptions. Governor Jindal is reportedly developing a plan along these lines that is said to also include some type of income tax relief for low income Louisianans who will be hit hardest by shifting the tax structure to rely more heavily on revenue generated from the sales tax. 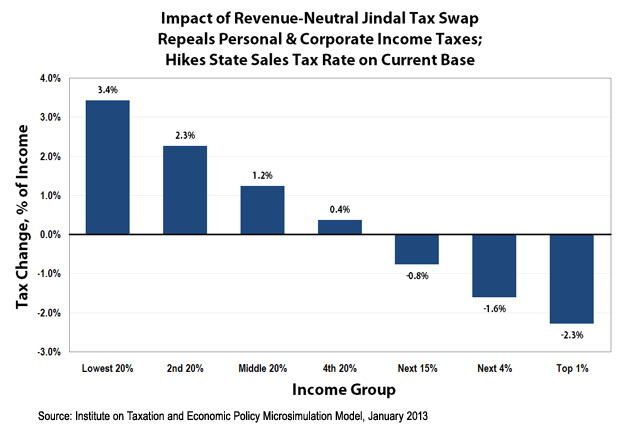 The Institute on Taxation and Economic Policy (ITEP) used its Microsimulation Tax Model to show the impact of eliminating the personal and corporate income taxes and increasing the sales tax rate to achieve overall “revenue neutrality”—a goal the Governor previously said would be part of his tax reform agenda. The ITEP analysis does not include any low income tax relief because the mechanism for that relief is unclear at this time. However, it is worth noting that any low income tax relief will likely be insufficient to off set the impact of the large sales tax hike necessary to make this tax swap revenue neutral. (The low income tax relief will also need to be paid for which will likely mean that middle class families will see an even larger tax hike than that described below.) The overall shift in tax liability is so dramatic that the plan is virtually guaranteed to have a regressive impact regardless of whether or not a low-income relief program is added to the package.